Our Thermal Battery technology is modular, scalable and built for purpose. It is made from abundant, recyclable and non-hazardous geomaterials: steel and concrete. Easy to acquire, this means that local workforces and materials can be used, and transportation can be kept to a minimum. The technology behind our Thermal Battery System is field-proven with verifiable performance. The unique design enables us to construct very compact energy storage systems with high energy density, small footprint, and very low energy losses while capacities may range from MWhth to GWhth. In 2015, we installed and commissioned our Thermal Battery pilot with combined capacity of 1 MWhth at the Masdar Institute Solar Platform (MISP) in Abu Dhabi, UAE. The system was operated on a continuous basis with an energy cycling profile resembling operation in a power plant. 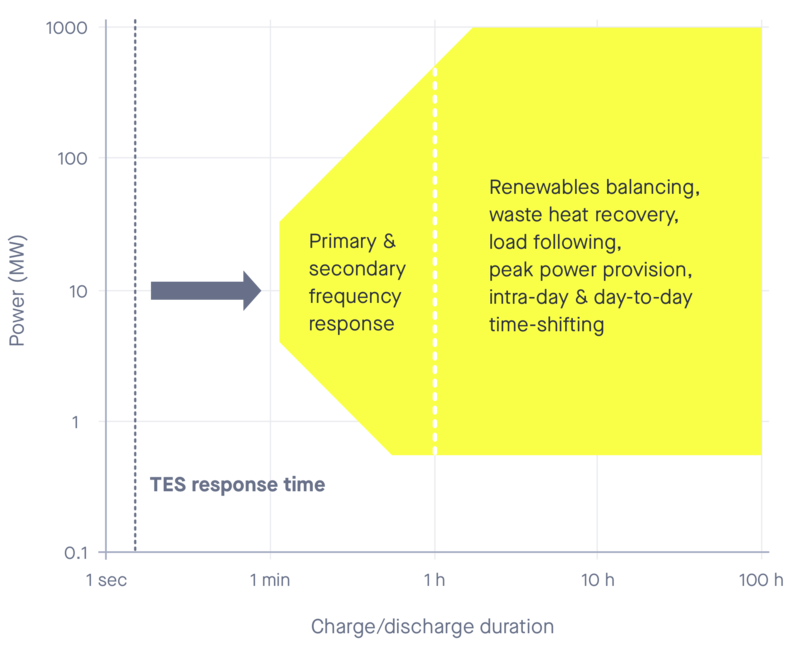 We have compared the measured performance of the Thermal Battery over several thousand operating hours, and the results show nearly indistinguishable differences between measured and predicted performance. Collaboration with major companies such as SIEMENS (control systems) and DOW Chemical (HTF), and technology verification by Masdar Institute and independent third parties including DNV GL and Fichtner validates our Thermal Battery System. The demonstrated and measured long-term effect of the Thermal Battery System installed and tested at the MISP shows no sign of change in performance, and proves the operational capabilities of the technology and modular EnergyNest Thermal Battery design. The key components of our Thermal Battery include a high-performance type of concrete-like storage material, and steel; the main constituents for the storage material and the steel can be sourced globally. The system simplicity and use of low-cost materials results in very low CAPEX as well as nearly negligible OPEX throughout the lifetime of the Thermal Battery. Typical life time is minimum 30 years and more likely over 50 years. Energy in form of heat at high temperature is transferred to the Thermal Battery using a heat transfer fluid (HTF) inside pipes cast into the Thermal Battery elements. There is no direct contact between the heat transfer fluid and storage material, and the thermal elements with steel piping are compatible with common HTFs such as thermal oil, water/steam or compressed gas etc., which enable straightforward integration within a wide range of applications. 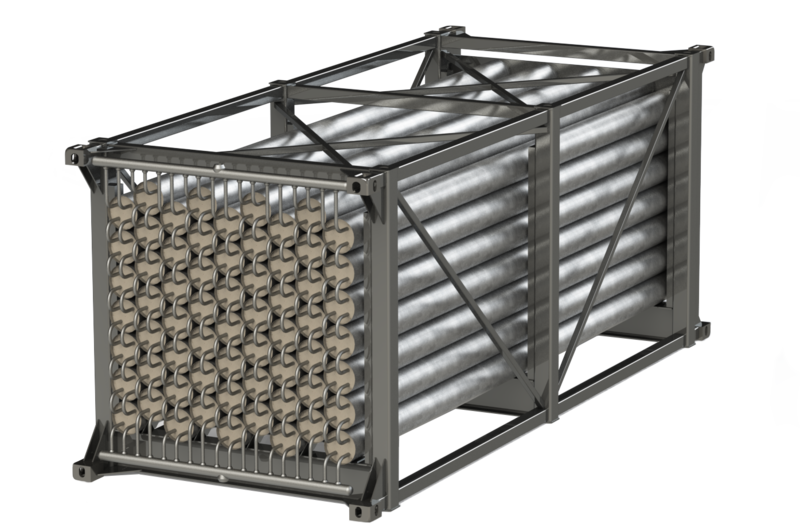 When charging the Thermal Battery System, hot HTF flows through the steel pipes from the top to bottom, transferring its thermal energy to the storage material. Energy is stored with minimal heat loss until it is needed. During discharge the flow is reversed; and cold HTF flows in at the bottom and exits hot from the top of the Thermal Battery. With water/steam as HTF the Thermal Battery acts as a steam cooler and condenser in charge mode, and as a boiler and superheater in discharge mode, using the same principles of steam generators installed in conventional- and solar thermal power plants. Multiple elements are combined in a Thermal Battery Module, which form the basic units that make up the Thermal Battery System. The modules are designed for easy transportation, on-site assembly and the majority of piping works to be prefabricated and pressure tested before installation.